When a privately funded team of astronomers discover a large asteroid on a trajectory toward earth, their discovery sets civilization on a collision course with the unyielding wheel-work of the universe. The reality of physics, and the time frame from discovery to impact, pushes humanity into an almost impossible race against extinction. Fearing panic, the US government chooses to keep the existence of the asteroid secret until it has launched a mitigation project. However Colton Taylor, the corporate sponsor for the detection program that made the discovery, also knows the truth. Throwing his technological empire into an independent strategy for survival, Taylor believes that Stormhaven’s secrets might just give humanity a chance. Unfortunately, implementing his plan will put his knowledge of the looming disaster in the public eye, and the US government sees that as a serious threat to national security. They are willing to go to extraordinary means to contain that risk, but when he pushes out and forms an international alliance against them, the Administration finds hiding the truth is far less important than the fight for survival. Some secrets are far too big to contain. 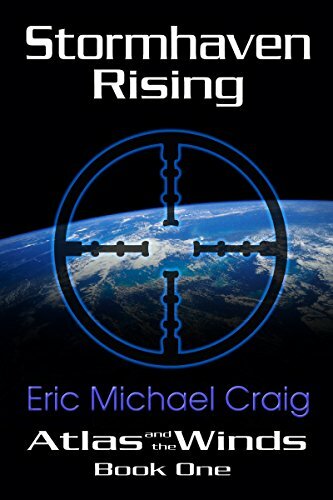 Stormhaven Rising is a visionary look at what happens when crossed purposes collide with hard reality on the precipice of doomsday. Okay, you realistic sci-fi fanatics out there, you’re gonna love this one. I felt as though I’d been placed into the hands of a master science fiction storyteller. Real characters, (faults and all) plausible realistic plot, and exciting, descriptive setting. A large asteroid is headed straight for earth, humans facing almost certain extinction if it hits. The government, not surprising, wants to keep the asteroid a secret, an attempt to hold off world-wide panic. But there are others, such as Colton Taylor, (a corporate sponsor for the detection program that made the asteroid discovery) who believe they have a plan that might give humans a chance to survive. But it means putting the disaster in the public eye and the government doesn’t want this. There was a Bruce Willis movie made a while back that had this same type of plot disaster, but it had more of a comedic feel, at least in my opinion. This story sounds plausible and realistic from start to finish. I never once questioned the science involved, and no magic either. No abracadabra used to try to help explain futuristic scenarios. They discuss potential problems faced should they tried to blow up the asteroid, to attempts to somehow push it off course. I enjoy science fiction novel like this one, but often I’ll find myself feeling a bit lost, struggling to keep up with the science part, especially if it doesn’t make complete sense. Though there are technical issues galore here, I never once struggled to understand. You feel as though this asteroid is really headed our way and we need these people, real people, to come up with a way to help save us, the technology offered totally believable. A well-deserved five out of five stars. Posted by Denna Holm on August 28, 2016 in Archives and tagged asteroids, chilling, Science Fiction, space, tense, thriller.